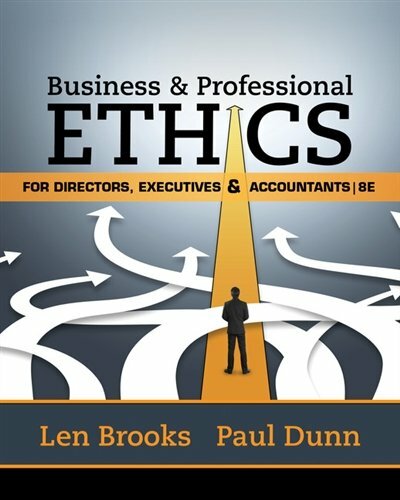 1305971450 -The most comprehensive book of its kind, BUSINESS & PROFESSIONAL ETHICS FOR DIRECTORS, EXECUTIVES & ACCOUNTANTS, 8E combines explanatory text, cases, video sources and readings. Students explore the historical background behind corporate governance, behavior, compliance, risk management, and professional accounting. The book emphasizes how to develop an ethical corporate culture and make decisions that reflect organizational values, ethics and the expectations of stakeholders. Students see the ethical influences on company success and better understand their own professional codes and duties. They analyze the IFAC Code of Ethics and AICPA and CPAO codes as well as fundamental principles, independence, conflicts of interest, and risk assessment. They also examine the risks and opportunities of non-assurance areas, such as CSR, workplace ethics, fraud and white collar crime, bribery, and crisis management. More than 120 engaging cases help students and practitioners avoid errors.